President Donald Trump’s abrupt decision to pull American troops from Syria is riskier than it looks. It ends a low-cost, high-impact mission and creates a vacuum that will be filled by one of a series of bad actors -- Iran, Russia, Turkey, Islamic extremists, the Syrian regime -- take your pick, they’re all dangerous for American interests in the Middle East. Trump’s withdrawal from northeast Syria will end a campaign that was never really seen or understood by the American people. It was a small-footprint, low-visibility war carried out by US Special Operations forces, in partnership with a Kurdish-led militia. Because most Americans didn’t watch the conflict on television, they didn’t appreciate the unlikely fact that it was successful. It destroyed the Islamic State group; it stabilized northeast Syria; it blocked Iranian expansion; it checked Russian hegemony; it gave the US some bargaining leverage for an eventual political settlement in Syria. But none of that evidently mattered in the end to Trump. He was elected to end wars in the Middle East, even successful ones. On this, as so many issues, he was determined to fulfill his campaign promises, consequences be damned. His Syria decision was opposed, near as I can tell, by the Pentagon, the State Department and key regional allies. Trump did it anyway. This decision scares me partly because I’ve seen with my own eyes the hard-won gains we may be giving up, in visits to the secret bases where this war was waged. It’s hard to describe the competence of American troops in Syria without sounding corny. Suffice it to say that they found a way to project American power with maximum damage to the enemy and minimum cost for America. We can grant some of Trump’s larger points, even as we assess the potential costs of his decision. Every war must end, as strategist Fred Ikle once remarked about Vietnam, and the war against the Islamic State group had all-but-ended. As the terrorist threat receded, so did the legal rationale for deploying American troops -- the overstretched “authorization to use military force” against terrorists passed on Sept. 14, 2001. The White House shouldn’t be faulted, either, for stressing that America’s national military strategy now focuses on the threat of great-power competitors, Russia and China, rather than terrorists. US strategy became lopsided after 9/11, misallocating resources, and now it’s time for a rebalancing. I get all that. America was going to have to break the Kurds’ hearts eventually -- as we seem to with so many of our brave allies. But not now, not when Turkish President Recep Tayyip Erdogan was threatening an invasion, trying to jawbone America into abandoning its allies. This kind of bullying shouldn’t work against a superpower. But sadly, it just did, with lasting cost to American credibility. Senior administration officials try to put the best face on Trump’s mistaken decision. “This will be a measured, step-by-step withdrawal,” says one. “It will be conditions-based, with the timeline moving left or right depending on force protection and other factors.” That’s what you’re supposed to say about a pullout, but I doubt it will convince many people in Tehran, Moscow or Ankara. What’s truly distressing is that until Trump’s sudden turnabout, the United States had something of a virtuous cycle going in the region. Not only was the Islamic State group almost extinguished, but US power was creating conditions for future stability. The new Iraqi government was eager to be a partner; Iran was realizing it had overreached in Syria; Sunni Arab allies such as Jordan, Egypt, Saudi Arabia, and the United Arab Emirates wanted to help contain Turkish power and create a more stable Syrian state. Trump aborted this positive momentum. He ceded power in northern Syria to Turkey and its proxies, which have made a ruinous mess everywhere in Syria they’ve tried to control. He abandoned a Syrian Kurdish ally that had imagined that sacrificing lives at America‘s request would count for something. It didn’t. Trump’s Syrian legacy: He has proved even more irresolute than his predecessor, Barack Obama. How does that feel, Mr. President? 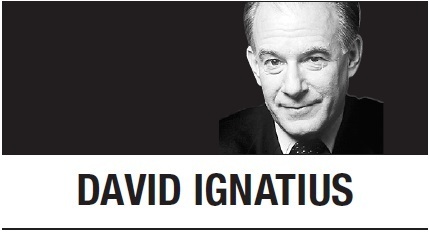 David Ignatius can be reached via Twitter: @IgnatiusPost -- Ed.